Most of the eye’s interior is filled with vitreous, a gel-like substance that helps the eye maintain a round shape. There are millions of fine fibers intertwined within the vitreous that are attached to the surface of the retina, the eye’s light-sensitive tissue. As we age, the vitreous slowly shrinks, and these fine fibers pull on the retinal surface. Usually the fibers break, allowing the vitreous to separate and shrink from the retina. 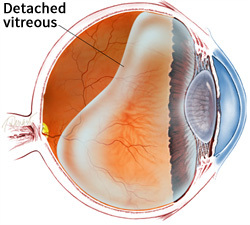 This is a vitreous detachment. The condition is common for older adults; over 75% of those over the age of 65 develop it. Although less common among people in their 40s or 50s, the condition is not rare for those individuals. Some research has found that the condition is more common among women. Although a vitreous detachment does not threaten sight, once in a while some of the vitreous fibers pull so hard on the retina that they create a macular hole to or lead to a retinal detachment. Both of these conditions are sight-threatening and should be treated immediately. If left untreated, a macular hole or detached retina can lead to permanent vision loss in the affected eye. Those who experience a sudden increase in floaters or an increase in flashes of light in peripheral vision should see an eye care professional as soon as possible. To schedule an appointment with Dr. Roger Weikum or Dr. Tyah Johnson, please call (214) 220-2425 or click on the button below.